"a decrease in the rate of asexual growth in erythrocytes associated with a lower number of daughter merozoites generated per schizont, and second, a dramatic reduction in the ability to produce oocysts in the mosquito vector. 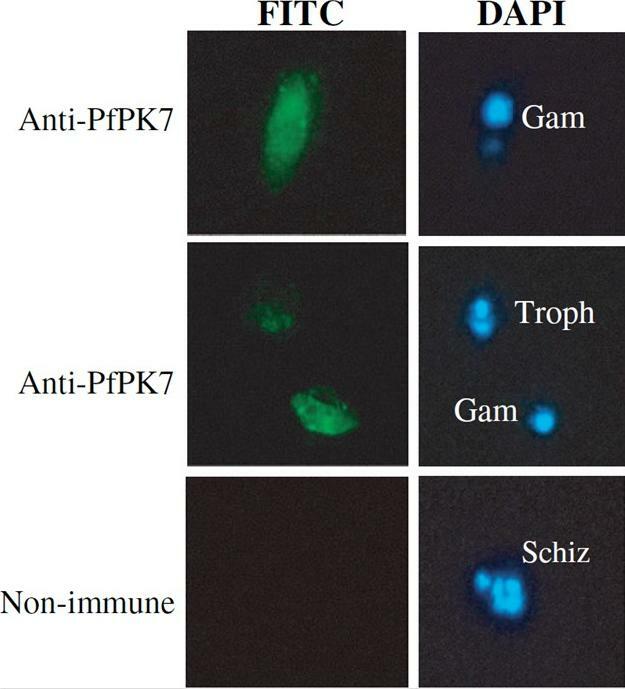 A normal asexual growth rate and the ability to produce oocysts are restored if a functional copy of the PfPK7 gene is reintroduced into the PfPK7(-) parasites"
Do not respond to melatonin-stimulation, but do upon complementation. Immunofluorescence detection of PfPK7 expression during erythrocytic development. The IgY against a peptide derived from PfPK7 (see Experimental procedures) and a FITC-conjugated secondary antibody were used to investigate the localization of PfPK7 during erythrocytic development. The slides were pre-stained with DAPI to visualize nuclear DNA. Gam, gametocyte; Troph, trophozoite; Schiz, schizont. Immunofluorescence microscopy using the anti-peptide antibody shows that the PfPK7 protein localizes throughout the cytoplasm of both asexual parasites and gametocytes, with some punctuated pattern apparent in the latter, which has not yet been investigated further.Dorin D, Semblat JP, Poullet P, Alano P, Goldring JP, Whittle C, Patterson S, Chakrabarti D, Doerig C. PfPK7, an atypical MEK-related protein kinase, reflects the absence of classical three-component MAPK pathways in the human malaria parasite Plasmodium falciparum. Mol Microbiol. 2005 55:184-96.